I went to see Finian's Rainbow again on January 17th with my mother in tow. Outside, it was blustery, dreary, rainy, and wintry, but inside it was warm, bright and beautiful. Unfortunately, it also happened to be the final performance. But even such a sad occasion could not dim that rainbow at the St. James. Finian's Rainbow, a revival of the 1948 musical, was perhaps the brightest spot on the traditional Great White Way this season. It certainly had the best reviews yet of year. It was the first leading lady turn on Broadway for the sparkling Kate Baldwin. 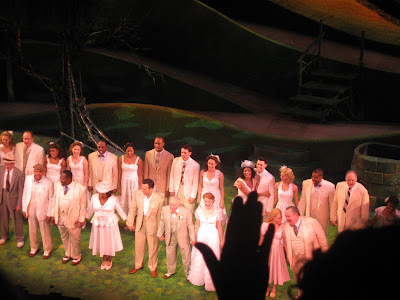 Joining her was the best ensemble cast that Broadway has had in years: Jim Norton, Cheyenne Jackson, Terri White, Christopher Fitzgerald, Chuck Cooper, David, Schramm, William Youmans, Guy Davis, Alina Fay, Brian Reddy, Tanya Birl, Christopher Borger, Meggie Cansler, Bernard Dotson, Leslie Donna Flesner, Sara Jean Ford, Taylor Frey, Lisa Gajda, Kearran Giovanni, Tim Hartmam, Tyrick Wiltez Jones, Kevin Ligon, Monica L. Patton, Joe Aaron Reid, Devin Richards, Steve Schepis, Rashidra Scott, Paige Simunovich, James Stovall, Lauren Lim Jackson, Grasan Kingsberry, Elisa Van Duyne, Aaron Bantum, Brian Sears, and Elisa Van Duyne. The house was completely full. Mom and I were seated amongst a group of high school choir students from Katy, Texas. At first I was chagrined since I have not necessarily had good luck with the behavior of student groups in the theatre, but they turned out to be lovely. That's probably a testament to the fact that despite some opinions that this was an old fashioned, out-of-date clunker of a story, the combination of the cast, choreography and fabulous tune after tune combined with a full orchestra lead to a rip roaring good time in the theatre. The cast poured their heart in to every moment. Every number and performer received loud appreciation from fans there for the last time as well as the general audience. Even though the curtain fell, there's still an opportunity to hear them on the cast album that was just released. It's the best capture of the spirit of this cast or any cast in many years. My friend Kevin Daly raves about the album, thoroughly and thoughtfully at Theatre Aficionado at Large. As I listen right now, I'm thrilled at how many the songs are so very listenable, some pure joy, while others transportive in their emotions. This is a show I'll remember for it's fun, but especially for the first time I saw my lovely friend Kate Baldwin as the leading actress in a Broadway musical. Technically unemployed, Kate is already in high demand: she'll be performing at the Kennedy Center in Washington, D.C. on Monday, February 8th; at Birdland on March 8th; a party celebrating the opening of un peu de limonade on March 1st; and, Project Shaw's St. Patrick's Day Gala on March 17th. I have no doubt that Kate will take the stage again soon as one of the greatest leading ladies of Broadway. I'm so happy I was able to see Finian's Rainbow. It was fun and I really thought it would make a great family musical. Magic for the kids, a love story for the adults. And Kate Baldwin, wow. She is so lovely. I will always remember "How Are Things in Glocca Morra?" I'm glad you got to see it one more time before it closed, and with your mom!